Krapp, 39 is the fine, funny monologue currently at the Soho Playhouse that was inspired by Samuel Beckett’s Krapp’s Last Tape. 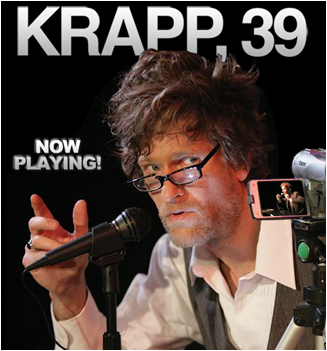 In Krapp’s Last Tape, a 69 year old man ruminates on his life while listening to a tape he recorded when he was 39. Krapp, 39 is the invention of Michael Laurence. The clever premise is that on this, his 39th birthday, Laurence records a tape that he will use 30 years from now in a production of Krapp’s Last Tape. The tape is a jumping off point to examine his life. Could you sit alone on a stage and reveal all your personal and professional failures to an audience? Not I. We learn what it’s like to be an actor barely scraping by. Actors cannot plant roots. They travel from town to town looking for work in regional theater. Relationships don’t flourish and having children is out of the question. Although he lived that way for many years, Laurence isn’t having a problem right now. This show overlaps with his work as an understudy in the upcoming Broadway production of Eugene O’Neill’s Desire Under the Elms with Brian Dennehey. To accommodate this overlap, curtain for Krapp 39 is at 5:00. After his :90 minute monologue, he dashes uptown for rehearsal. I suppose it’s an actor’s dream, although I would need a nap between gigs. The way you describe your theatre visits in such a delightful way, makes me honestly believe that you should be writing critique for a living.Honestly.. you’re that good.